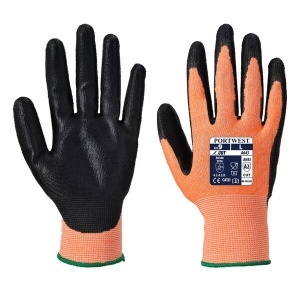 Designed to protect against cuts, the Portwest Amber Cut-Resistant Nitrile Foam Coated Gloves A643 (Case of 144 Pairs) are certified for use with food while being resistant to greases, fats and oils. Additionally a nitrile foam coating provides outstanding grip, allowing the user to use sharp equipment such as knives safely without the risk of cuts. The Portwest Amber Cut-Resistant Nitrile Foam Coated Gloves A643 are popular gloves, and with this offer you can buy a case of 144 pairs at a discounted price. Ideal for businesses that require high levels of health and safety, this offer lets you save money on your essential safety wear. To purchase these gloves in a single pair, please see the standard listing. Because the Portwest Amber Nitrile Foam Gloves are highly cut resistant and extremely flexible, they are ideal for use in tactile environments. They are certified for use with food and can resist oils and fats, meaning that they are perfect for food based applications.